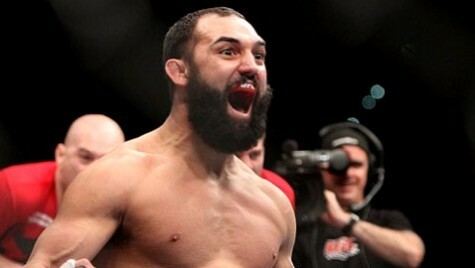 Johny Hendricks became the new UFC welterweight champion, defeating Robbie Lawler in the main event at UFC 171 in Dallas on Saturday night. Hendricks captured the vacated belt by outpointing his opposition for the majority of five rounds, earning the unanimous decision with scores of 48-47 across the judges’ panel. Lawler was the first to land a significant strikes, swarming in on Hendricks with a flurry against the cage. Hendricks shot in twice for takedowns, but the attempts were stopped by his opponent. Since he couldn’t get the fight to the ground, Hendricks then clinched and landed combinations, including punches and kicks that scored him points throughout the first round. Lawler opened up in the second round and became more active in landing punches, but Hendricks followed up with combinations of punches and landed accurate leg kicks. Lawler rarely stepped out of the pocket, standing in front of his opponent while trying to find a knockout punch. Hendricks, however, picked away at Lawler for a majority of the round. Just before the end of the time frame, Lawler landed a strong left that, but Hendricks grinned it off just after the strike. Hendricks continued to mix things up in the third round, landing both punches and leg kicks. Lawler then landed a left hand that shifted the momentum of the fight, wobbling his opponent and following that up with a barrage of punches. Hendricks recovered from the attack, returning to utilizing combinations to score points, but Lawler traded away with his opponent through the end of the round. The two fighters continued to trade strikes the back-and-forth match. Hendricks first came forward with punch-kick combinations, then Lawler worked punches to the body and the head. Lawler opened up a cut on his opponent’s right cheek, but Hendricks scored his first takedown towards the end of the round. The fifth round had both fighters looking to trade hands, each of them landing flurries. Hendricks landed a left hand that rocked Lawler, following that up with more strikes that backed his opponent up. Later, Hendricks scored one more takedown before time expired, and was then named the new UFC 170-pound title holder. With the win, Hendricks becomes the division’s first new champion in six years, after former champ Georges St-Pierre recently vacated the title to focus on personal issues.